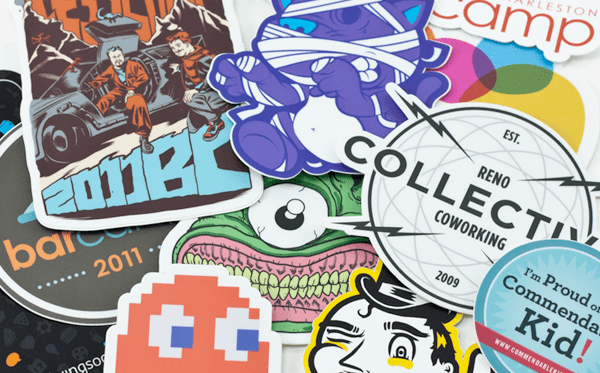 Stickers are a preferred way to represent your business in an effective, attractive and cost-efficient way. Vinyl stickers offer colorful graphic display with great quality. They can be put outside since they are more resistant to the influence of weather than the ordinary paper stickers. They can be made with gloss finish, die cut and have a richer variety of shapes, designs and applications. That’s why they allow us more creative options. Stickers are a versatile way to meet our advertisement goals and grab the attention of potential customers. This is because of their vibrant color palette, abundance of designs, endurance to sunlight, moisture and other weather conditions. 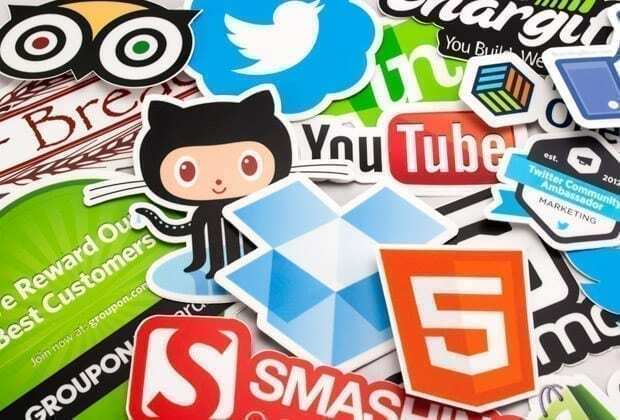 When choosing a suitable type of sticker for the purposes of our advertising campaign, we should consider several factors. They include – what environment we plan to put the advertisement, whether it will be outdoor or indoor, for how long and the size type we want. Most importantly, we should determine what is more important for us durability or price. By learning how vinyl is made, we can be able to make a more informed and wise choice of a suitable vinyl material for our signage. In short, vinyl films are made from polyvinylchloride (PVC) polymer. This gives rigidity, to the material and other ingredients like pigments and plasticizers, to achieve additional flexibility. Also fillers, heat stabilizers and UV absorbers increase the film’s resistance to UV radiation. Stickers can be two types: cast and calendered. These two terms simply describe the processes in which vinyl stickers are made. At first sight they may look the same but the technology behind their manufacturing process is different. Therefore comes the question which type of vinyl sticker to choose for our business. Let’s take a look at the advantages and disadvantages of both adhesive vinyl types. In simple words the manufacturing process of calendered vinyl can be described as something similar to kneading a dough. The film for this type of vinyl is made from similar ingredients to these used in the cast vinyl’s film. PVC powder, liquid softener, stabilizers, colors, resins are mixed into a fine powder mixture called “melt“, which goes through an extruder where it’s blend into a uniform mass. Adhesive is also add to the liquid mixture which can increase the film’s thickness with 1 to 2 mm. Next, the series of large calendering rolls in the extruder, which are heated up to 350 °F, rotate and flatten out this paste into a 2.0 to 4.00 mm thick strip whose length can reach 90 feet depending on the customers’ specifications. 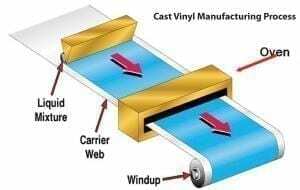 The calendering process includes heat and constant pressure and stress put on the vinyl strip, that is stretched and then pressed into its final form. After that, the film goes to an embossing station, where different patterns and gloss effects are added. To get a high gloss, vinyl film different embossing tools and calendar line settings are used, for each surface. 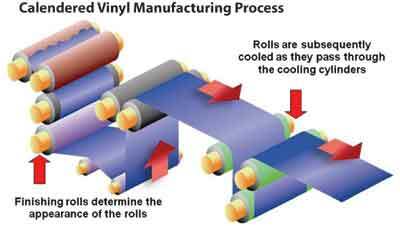 After this process, the calendered vinyl film is cooled down and transported to a winder. Because the end result is a stiff and thick flim, which is not pliant enough to be applied on a variety of complex surfaces, calendered vinyl is suitable for short-term advertising campaigns. Its advantage, over the cast vinyl, is that it costs less and is usually printed in large batches. It’s resistant to scratches and more easy to handle due to its heavy weight. This makes the vinyl stickers more easy for replacement. Calendered vinyl can last from 1 to 7 years depending on whether it’s made from monomeric or polymeric plasticizer. The quality of the plasticizer has a key role to the performance of the vinyl material. It’s suitable for short-term or medium-term display, such as window and floor graphics, partial wraps and especially point of purchase. So, it may not be a good option for vehicle wrapping. This is because we need a durable material with high resistance to UV rays and the elements. This vinyl type also has a limited color palette to choose from. Contrary to the belief that the thickness of the calendered vinyl adds more resistance, its life is shorter than this of the cast vinyl stickers. It’s not protected against heat and cold exposure, because tends to shrink to its original size. Fortunately, there are improvements in the production of calendaring vinyl stickers. They include more glossy finish, addition of adhesive and new colors, better formulations and the reduction of the internal pressure and stretching. This decreases the stickers’ level of shrinkage, improves the appearance and brings their quality closer to this of the cast vinyl stickers. When the correct adhesive is added, calendered vinyl can be printed with a variety of colors and gloss levels to meet the needs of almost any outdoor application. Around 15 years ago, when the printing industry started,using vinyl for the first time, the vinyl casting technology was considered the best method for printing prime quality stickers. We can describe the process of vinyl casting as something similar to baking a cake. The vinyl used for cast vinyl stickers is made by preparing a mixture of different liquid ingredients (PVC resin, pigment, plasticizer, UV-absorber, fillers, heat stabilizers). They are added to a bowl in a specific order and then mixed together for a specific amount of time and with a particular speed to result in a stable mixture. A thin film of this mixture, which is called “organosol”, is poured on a casting sheet, which sets the texture of the film. Then it goes through ovens which bake it in order to evaporate the solvents. A hard film should form which is then wound in large rollers for further adhesive coating. This printing process offers a stable and flexible film with surface gloss. This holds well the colors and adheres smoothly to a variety of surfaces, because there is no pressure and stress. Since cast vinyl stickers are thin, they can last really long time (5 to 12 years). You can also apply them on all types of uneven surfaces like curves and corrugations. Vinyl stickers are perfect for outdoor display use. A good example is a fleet vehicle wrapping, but depending on the raw materials used in the printing process. When compared to calendered vinyl sticker, this type of sticker has more durability, conformability. It doesn’t crack, shrink or fade, it’s glossier and offers more color options. That’s because the casting machines are smaller than the calendaring machines and their sheets are short. The materials in cast vinyl stickers has higher quality than these calendered vinyl contains. The UV absorbers and pigments help them preserve their color better. It’s considered best long-term advertisement sticker option, but it’s only disadvantage is that its price is high. Calendered and cast are simply terms describing the technology by which vinyl is produced. They shouldn’t be solely related to the performance characteristics of the vinyl film such as weather resistance, glossiness, thinness, shrinkage level. If your goal is indoor signage or short-term outdoor display, then calendered vinyl stickers are the type for you. But if you want outdoor vinyl sticker that will last long and has high performance on different surface applications, then the top choice is cast vinyl. Before choosing a type of vinyl sticker, it’s essential to decide what are the goals of our advertising campaign in order to avoid redos and waste of money. This entry was posted in Knowledge Center. Bookmark the permalink.